VW labor representatives will travel from Germany to the automaker's Tennessee plant, shown. HAMBURG (Reuters) -- Volkswagen's works council said it would press on with efforts to set up labor representation at the automaker's U.S plant in Chattanooga, Tennessee, after workers there voted against any such step involving the United Auto Workers (UAW) union. Employees at the plant, in a region traditionally hostile to organized labor, on Friday opted to reject representation by the union, whose membership has plummeted 75 percent since 1979 and now stands at just under 400,000. "The outcome of the vote does not change our goal of setting up a works council in Chattanooga," Gunnar Kilian, secretary general of VW's works council said in a statement on Sunday, adding that workers continued to back the idea of labor representation at the plant. VW's rise to become one of the top three global carmakers is intertwined with the influence of labor, whose representatives make up half of the automaker's 20-member supervisory board. Under the group's "co-determination" policy, workers have a say over matters affecting work rules and the workplace environment while the consensual structure allows management to draw on labor support in decisions on new products and plants. Kilian said he would travel to the United States to meet labor law experts and start consulting with them in the next two weeks to "define further steps," adding he would be joined by Frank Patta, secretary general of Volkswagen's global works council. Opposition to UAW involvement stemmed from concerns among many workers that a union would strain cordial relations with the company, which pays well by local and U.S. auto industry standards. Some experts contend that VW needs a labor union in the United States to help set up a works council in Chattanooga, where it builds the Passat mid-sized sedan. 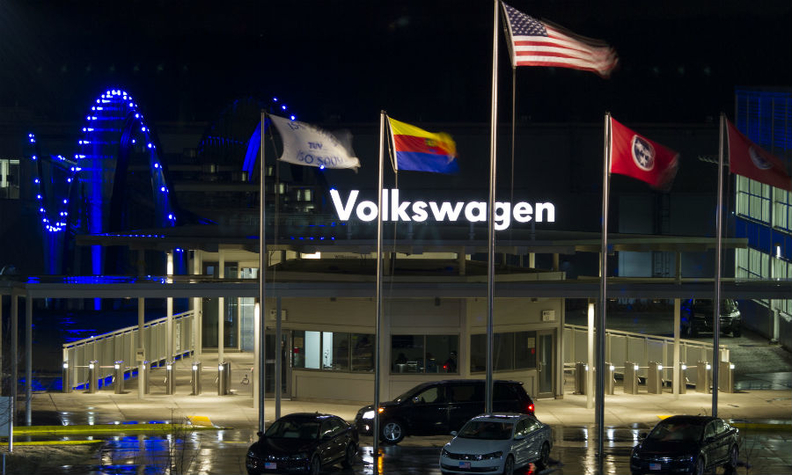 "Representation in Chattanooga is paramount to the unions at VW," said Ferdinand Dudenhoeffer, head of the Center of Automotive Research at the University of Duisburg-Essen. "The U.S. are the last blank spot on VW's global map where labor does not yet have a voice. The VW Group's works council will do what it can to change that and it's fully backed by management." Following a 2011-2012 sales surge in the United States, VW has hit an American pothole in the road to global supremacy and needs more models designed for U.S. consumers and manufactured completely in the region, analysts say. The German group, languishing in the bottom third of U.S. quality rankings, ousted its divisional chief, Jonathan Browning, in December after U.S. deliveries fell 7 percent in 2013 as a push into competitive mid-sized cars lost traction. To counter this poor performance, VW is planning to spend $7 billion in the region and build an SUV tailored for the North American market. The Tennessee decision is likely to reinforce the widely held notion that the UAW cannot make significant inroads in a region that historically has been against unions and where all foreign-owned vehicle assembly plants employ non-union workers.